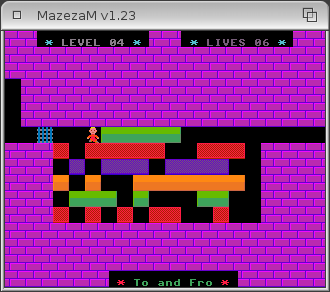 MazezaM is a puzzle game, where the player has to pass through the levels by sliding the walls to left and right, opening corridors between. The rules seem simple, but the game gets harder and harder as the stages go on further. Sometime, the reach to the end seem unsolvable, but there is always a solution at the beginning. If a level is rendered by the player unsolvable, there is a possibility for a replay in the room from the initial position, but this is at the cost of a life. After all the lives are used, the game is over and have to be started again from the first level. 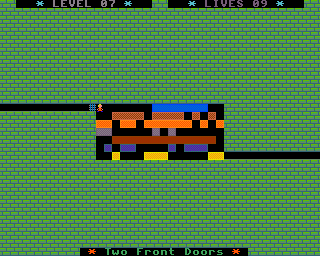 If the level room is passed, the player is rewarded with extra life, which comes handy in the next levels. 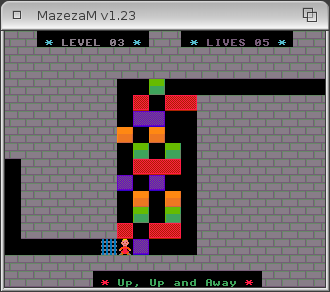 The puzzle game for the AmigaOS was developed from scratch for many years, incorporating functions and features from other projects developed. Finally I ported it to the multiplatform SDL library, meaning it just needs a recompile, to work on other platforms, supported with the SDL. I used the basis already established with the BoxWorld port to the AmigaOS 4 and the Apple Mac OS X. The game is not resource demanding and works fine, without raising the CPU meter. Music songs, animations, scrolls and colorful graphics are present and developed especially for and on the Amiga platform. The game can be played on Workbench window or in full screen. Apple Mac OS X - exact port of the AmigaOS 4 version. Rockbox - the game on the open sourced firmware for mp3 players. MazezaM is very catchy game and its wide availability on the different range of platforms, makes it a perfect game for the puzzle games fans. It can be played with joystick or keyboard. The game on AmigaOS 3 have tiny, Sensible Soccer alike character and graphics and is playable only in fullscreen mode. The screenmode can be selected at the beginning of the game. It also works on AmigaOS 4, but without the music, because of the assembler music routines used, which directly access the hardware of the classic Amigas, which is not present on the new Amiga machines. But it is perfectly playable with E-UAE on the AmigaOne.